The wonderful coloring of the moon, when more than one-half of its disc is immersed in the shadow of the earth, which, as we know, is produced by the refraction of the rays of the sun in the atmosphere of the earth itself has as yet not been faithfully reproduced by any one. 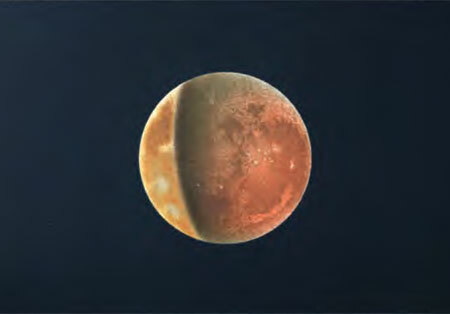 While the eclipsed moon stands out glowing against the dark sky, it offers such a variety of the most delicate tints of red, brown and blue that the artist is inspired by the beautiful sight, and seeks to reproduce what he sees. Through similar impressions I was led to attempt the painting of the phenomenon of the 28th of January, 1888. Relying upon my color-memory I made notes during the eclipse of the colors and localities where they were to be seen, and the very next morning I executed the picture in water colors. Without relying upon one’s memory, the following would seem the safest method by which to make a correct picture of the appearance and values of colors seen at night. The night scene should first be painted at the telescope by the aid of lamp light. In this case, however, the color gradations, made by daylight, could not be relied upon, as artificial light changes the appearance of the colors considerably; the correct tints would have to be found by experiment. Moreover, this picture, having been produced by lamp light, would, if examined by day, give an entirely wrong impression of the true appearance of the original. Consequently it would become necessary to illuminate the picture by day with the same lamp, after excluding all other light (perhaps by placing the picture in a closed box and examining it through a suitable opening) and to look upon it as a new original, and then to copy it by daylight in the usual manner. As regards my observations of this eclipse I refer to my article on the subject published in No. 2846 of the “Astronomische Nachrichten.” I observed with the six-inch STEINHEIL Refractor of the Prague Observatory, with a power of sixty diameters, and made my picture at 1 1h 18m Prague mean time. At this hour the rim of the umbra of the earth’s shadow passed through the centre of Mare Nectaris, through Mare Tranquillitatis and east of Mare Crisium as far as Mare Humboldtianum. Towards the bright portion of the moon the grayish black shading of the umbra assumed a smoky brown hue, in consequence of the penumbra of the earth ; whereas towards the eclipsed portion, south of Tycho and north of Lacus Mortis it changed to a bright blue tint, and still farther towards the northeast it turned to a most beautiful red, which may be described as being a subdued mixture of rouge de saturne and carmine; it exhibited almost all the detail of the lunar landscape, together with numerous bright objects. This red coloring was particularly beautiful over Mare Imbrium, Plato, Sinus Iridum, Copernicus, Kepler and Aristarchus, and extended in an easterly direction beyond Gassendi; while westerly from this crater Mare Nubium and Mare Humorum assumed a sombre black-brown aspect. The crater Aristarchus was as conspicuous among all other objects during the eclipse as it is when the moon is fully illuminated, owing to its remarkable brightness. In consequence of the technical difficulties which are encountered in the process of printing in colors, the relative values of the colors as well as the gradual decrease of the line of the shadow of the earth are not presented in the accompanying picture as correctly as might have been desired. On the whole, however, this reproduction may be called a satisfactory one. Image and text published in Volume IV of the Publications of the Astronomical Society of the Pacific – 1892, available at Google Books.